Paul and Linda McCartney, March 1969. Salvador Dali reading his biography, 6 May, 1959. Mahatma Gandhi arriving at Folkestone, Kent, 1931. Elizabeth Taylor, American actress, c 1958. 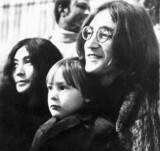 John Lennon, Yoko Ono, and John's son Julian, c 1969. Herbert George Wells, British writer, January 1940. Isambard Kingdom Brunel at the launch of the s 'Great Eastern', London, 1857. Funeral of Dr Annie Besant, Madras, India, 1933. American aviator Amelia Earhart, c 1930s. Rod Stewart, Dee Harrington and dogs, September 1973. Margaret Thatcher portrayed as a pirate, 30 April 1982.